Skip the restaurant and make your own copycat Chipotle Chicken recipe at home. The marinade is quick, easy, healthy, and tastes even better than the real thing! Make white meat or dark meat and follow my instructions for either baking or grilling. Chipotle Mexican Grill chicken is my go-to meal when I want fresh food FAST. Nothing tastes better than a giant burrito or bowl filled with rice, beans, veggies, guacamole, and of course, the chicken. The cornerstone of my order at Chipotle is always the chicken. It’s tender and juicy, packed with flavor, and perfect on everything. And whether you want to grill it, sauté it, or bake it in the oven, I’ve got all your options covered! Want to make Chipotle Chicken for a crowd? Use the handy slider in my recipe card to adjust the quantity up. It’s just that easy! That smoky, spicy flavor in Chipotle’s chicken comes from two primary ingredients: Dried ancho chiles and adobo sauce. Ancho Chile Pepper powder is available for purchase, or you may make your own. 1/4 cup of the powder is equivalent to 2 oz. of the peppers (stems and seeds removed, ground up). Slow-Soaking the dried ancho chiles takes at least 12 hours. Once the chiles are soft, I like to open them up, remove the stems, and rinse out the seeds (I recommend using kitchen or latex gloves). For additional heat, add in seeds from the chipotle peppers. Quick-Soaking method was identified by one of my readers (THANK YOU, RYAN!). To shave 12 hours off this recipe is nothing short of a miracle. 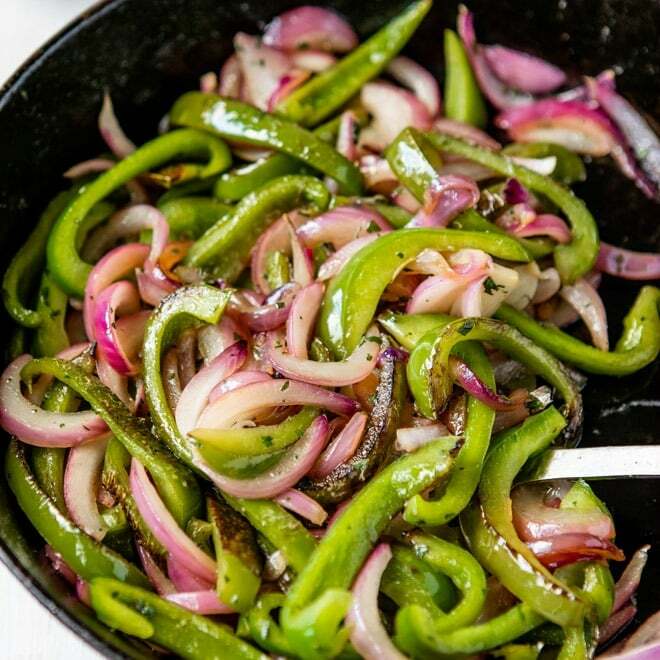 You toast the dried chiles in a skillet and microwave them in water. It works perfectly! Chipotle does not use red onion in their marinade. However, the recipe tastes better with it, so it comes down to this philosophical question: Do I post the recipe that tastes closest to Chipotle’s recipe, or do I post the recipe that tastes the best? I kept the onion. Combine all the marinade ingredients in a food processor or blender. If you’ve ever been to the restaurant, you know Chipotle grills their boneless, skinless chicken thighs on a flat-top grill. To the bowl of a food processor or blender, add red onion, garlic, adobo sauce, ancho chile powder, olive oil, cumin, dried oregano, 1 teaspoon salt, and 1/2 teaspoon pepper. Blend until smooth. Pour into a measuring cup and add water to reach 1 cup. Place the chicken in a large freezer-safe plastic bag. Pour in marinade, close the bag, and mash until chicken is evenly coated. Place the plastic bag in a dish and refrigerate at least 30 minutes or overnight. Heat 2 tablespoons oil in a large skillet until shimmering. Add chicken to the pan and cook, turning occasionally, until the temperature reaches 165 degrees on an internal thermometer. Depending on the size of your skillet, you can cook the chicken in batches. Remove to a cutting board and tent with foil for 10 minutes. Chop into small pieces. Season to taste with salt. Serve on tortillas or in bowls with additional toppings as desired. Preheat over medium-high heat. Coat with 2 tablespoons oil. Grill the chicken in batches, turning occasionally until the internal temperature reaches 165°F on a thermometer and bits of caramelized fond have begun to cling to the outside of the chicken, 10 to 15 minutes. Add 1 - 2 tablespoons oil to your grilling surface between batches. Preheat oven to 400 degrees. Coat a baking dish with oil or nonstick spray and arrange chicken in a single layer. Cover with parchment paper, tucking the paper around the chicken so it is completely covered. Bake for 30 to 40 minutes, until the chicken reaches 165°F when tested with an internal thermometer. Quick-Soaking method for ancho chiles: Remove stems and seeds from dried chiles (wearing gloves is recommended). In a dry skillet over medium-low heat, toast the chiles until fragrant but not smoking, about 5 minutes. Transfer to a medium bowl and add 4 cups (1 quart) water and 2 Tablespoons adobo sauce. Microwave on HIGH for 6 minutes. Drain, reserving 1/4 cup cooking liquid. Add peppers to the food processor, using the reserved cooking liquid to rinse as much adobo as possible from the canned chipotle peppers in Step 2. Slow-Soaking method for ancho chiles: Place in a bowl and add enough water to cover completely. Top with a small plate or bowl to weigh down the chiles so they are completely submerged. Soak at least 12 hours or overnight. Drain well. You can use either Italian or Mexican oregano. They have different flavors (Mexican oregano tastes more like marjoram) but both taste great in this recipe. Feel free to use whatever you have. What a fun theme! And I could feel the fear of the kitchen situation with the brick. Glad everyone survived ! ;) Can’t wait to see the rest of your Chipotle copycats! Yeah, all I can say is the brick thing is not cool. And it’s not just because I’m uncoordinated… although I am. :) This was a fun series to create, and even more so to EAT! I love Chipotle, and I really love being able to eat massive quantities in one sitting. if you do use 10lbs if chicken would you double your spices etc? going to have a large party. The recipe for the marinade above is enough for 10 lbs. of chicken; you don’t need to double the spices. I talk about it in my post, but not everyone has time to read my babblings. You will end up with 2 cups. of marinade based on my ingredients above (2 oz. dried chiles, 1 can of chipotle peppers, etc.). That is enough for 10 lbs. of chicken. I apologize for the confusion and I’ll try to reword the recipe so it makes more sense. I normally make the whole marinade recipe, freeze half, and cook 5 lbs. of chicken right away. Please let me know if you have any other questions! This is so delicious. I love this. Great idea. Hi, I would like to make this, however, does it come out very “hot/spicy”? My reason for asking is that I don’t believe the Chipotle Restaurant version is spicy at all. I mean I don’t ever remember it being spicy any time I’ve ordered it at one of their restaurants. Hi James, thank you for your question. First, I think “spiciness” is very subjective. If I eat chipotle’s chicken with sour cream and cheese or a burrito shell, it is never spicy because those offset. But if I eat it plain, sometimes it’s spicy. Having said that, I don’t think this marinade is super spicy. It has flavor, but you are using 1 cup of marinade per 5 pounds of chicken. And when you cook it, some of the marinade comes off. At worst, you may find a spicy bite here and there, but not really. My toddler (almost 2) eats it with no problem, and it’s not like we eat jalapenos for fun around here. To minimize the spiciness, be sure to get rid of all possible seeds from your adobo sauce. In the recipe I recommend straining, so you shouldn’t really have any, anyway. Have I answered your question? Or offered any help at all? I hope so. Spicy as in flavorful, yes. Spicy as it hot, no. Not really. Good luck. I’m really excited to try out this recipe. Where can I find the chipotle peppers and ancho chiles? Also, since I don’t have a grill, would baking the chicken be an option? TIA! Hi Ann, thanks for stopping by! Chipotle peppers are at most grocery stores, Walmart, and Target. They will be in the Mexican food aisle near things like green chiles and salsa. 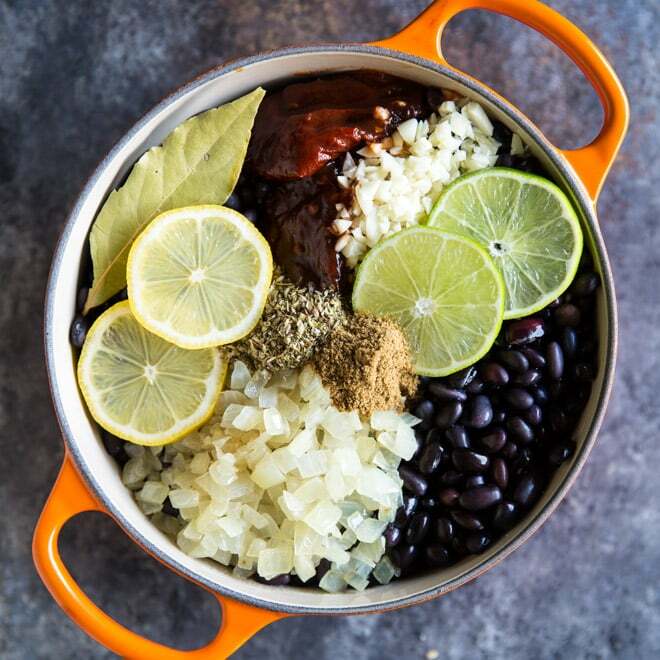 Just look for a small can, “chipotle peppers in adobo.” Ancho chiles are not as widely available, but Walmart and grocery stores do have them. They are large, dried chiles (maybe 6″ long or so) usually sold in clear plastic bags. International food markets also often carry them. McCormick also sells a bottle of Ancho Chile Pepper in their “gourmet” line of spices, so you could look for that. I will figure out how much of that spice you will need, if you go that route, and post another reply today letting you know. Just in case. Also some international food markets might sell “bulk” spices, and if so, you could find ancho chile powder there which would also work. Last, no problem about the grill! I usually use a cast iron pan now on my stove top. Baking the chicken would certainly work, but you would probably not got as many “caramelized” pieces as you would from a skillet. It will still be delicious and flavorful, I’m sure. If you don’t want to run your oven, you could also cook the chicken in a regular skillet (nonstick or otherwise) on your stovetop. Good luck! Thank you so much! Everything worked out and it tasted great! I made this yesterday – SO GOOD! Thanks for the recipe! Just wondering if you put any of the marinade on the chicken afterwards and it seemed a bit…dry? that’s not the write word, but just not as seasonful as chipotle. Thanks again for the great recipe! Hi Katie, I can imagine a lot of scenarios where the chicken might be dry. It hasn’t happened to me, but here are my suggestions. First, make sure you’re using dark meat, because chicken breast will obviously be drier. Also, as you cook the chicken in batches, if your skillet or grill pan seems dry, be sure to add more oil. Also, I appreciate the tip on adobo sauce. I think since you switched to the Adobo seasoning, that probably made your chicken much drier. I wonder if more liquid should be added to the marinade if you aren’t using adobo sauce? I also want to research adobo sauce and look at brands so I can (hopefully) suggest one that doesn’t have gluten. What a bummer! Thanks for your comments, and I hope your next batch is not so dry. I do think swapping the adobo sauce for seasoning was probably the biggest factor, if you followed the rest of the recipe. Thanks for your feedback! ALSO….those who are gluten free like me, BE CAREFUL with Adobo sauce…the ones I was looking at had the dreaded wheat in it. SO I actually just got some adobo seasoning instead. Hi Katie, I did some investigating and found a few brands of chipotle peppers in adobo without wheat. One is La Morena, the other is La Costena. Both are imported from Mexico and I found them at my local Walmart. I took pictures of the cans, so if for any reason you’d like to see them, just let me know and I can email them to you. Good luck! Meggan, were you able to figure out how much dried Ancho chili powder would be needed in place of the actual chiles? Lindsay, yes! Yes I was, sorry for not replying until you reminded me. It’s 1/4 c. of ancho chile powder. Thank you for checking back and sorry for the delay. I’m going to update the recipe now as a standard way to make it going forward. Thanks again! Hi Sonia, you are correct. Going forward I will always write out “cup” instead of abbreviating. Sorry for the confusion! I made all of this for my bunco gathering and all the gals went crazy! They said it was BETTER than Chipolte. I went on youtube and found a recipe for their medium salsa and used Chipolte Fan’s corn recipe……….it was AWESOME all together. Thanks! Love Bunco! :) I am so glad the recipe was a success for you. I am definitely going to look up/work on the salsa recipes too because they are so.good. Thank you for leaving a comment! Are you using Mediterranean oregano or Mexican oregano? I used Mediterranean oregano. It’s an excellent point to make though, maybe Mexican oregano would be a better ingredient here. Loved this chicken. Huge Chipotle fan, and my whole kitchen smells just like the restaurant after cooking this! I would have loved to have grilled the chicken, but my trusty cast-iron pan did just fine. I’m not a big marinade fan, choosing instead to season and perfectly cook meat to make it taste delicious, but this marinade was spot on and worth every minute of the overnight wait. Excellent! Wow, this is high praise! Thank you for taking the time to make the recipe and report back. A happy review doesn’t hurt. :) I am really glad you liked it. I spent a lot of time making this recipe over and over again myself. I too wish I could grill the chicken, but I always use a cast iron pan. Thanks again for your comment. This is by far, the best copycat recipe for the Chipotle Chicken dish! All of the spices presented matched perfectly! The only challenge that I had was cooking the chicken in a pan on an electric stove. Cooking it that way (I believe) gave it a gummy consistency. I had to almost burn the chicken for it to become more firmer. The chicken thighs that were used may not have been the best selection choosen. Perhaps grilling it or cooking on a gas stove would have produced better results for me. It’s winter here so I thought I’d try it indoors instead! Really miss my gas stove though. Gas stoves cook so much better. Thank you so much for sharing such an awesome recipe! Splendid! Recipe was spot on for chicken and white rice..even better than restaurant!! Wow. I did make a quick version of beans and corn salsa for my first time so it would save me time and I could focus on the chicken and rice. I grilled the chicken which really helps to keep authentic flavor. (BBQ on med heat, about 350 deg, flip after 10 min, cook 10 more min, should be done or close. Test with thermometer. 165 degrees in fattest part is safe. Pull it off grill and cover with foil for 7 min or so and dice it up. If it wasn’t 165 degrees, move away from direct flame but maintain bbq heat level for 5 more min, but you shouldn’t need to.) Family LOVES Chipotle and agreed it was awesome. Thank you!! Can you explain how to soak the chiles? I don’t see any information in the notes. Hi Artie, I’m so sorry about that! I’ve added information to the notes of the recipe about soaking the chiles. Here is the info: To soak the chiles, place in a bowl and add enough water to cover completely. Top with a small plate or bowl to weigh down the chiles so they are completely submerged. Should we be using the Mexican oregano or the regular kind? Can we substitute cumin powder for the seeds? I am using regular oregano because that is what I have. Mexican oregano is probably delicious too, possibly more authentic even, but I haven’t made it that way so I don’t know how different it would taste. I also used cumin powder, not seeds, so I’m sorry that wasn’t clear. I will update the recipe to reflect “ground cumin” so there is no further confusion. Sorry about that! Thanks for your comment! When cutting the ancho chile peppers open – do I discard the seeds or the pepper? Hi Tom, sorry for the confusion. For the Ancho chile peppers, you rinse out and discard the seeds and also remove the stem after they have been soaked. For the chipotle peppers in adobo sauce, you only use the sauce, so you can discard the chipotle peppers. I hope this helps. Thanks! How many ancho chile peppers are in a 2 oz package typically? It varies depending on the size of the peppers, but typically it’s either 2 large or 1 large and 2 small. That’s what I’ve seen in my experience. And “large” would be about 3″ to 4″ long, small would be about 2″ long. I hope this helps! how did I end up with only 1 cup? 1 cup of the marinade? That is incredibly strange if you started with 2 ounces of dried ancho chile peppers, a 7-ounce can of chipotle peppers in adobo, and 1/2 cup oil. The only other variable would be the red onion. I will weigh the red onion the next time I make this so I can advise the size. Each of the main components should account for roughly 25% (1/2 cup) of the total marinade: the soaked ancho chiles, the adobo sauce, the oil, and the red onion. Wow you’re quick on replies! I followed it to a T. I did use 1/4 cup Ancho pepper powder instead of the 2 oz. It made about 1-1/4 cup total. Okay. Clearly I need to go back to the drawing board on my Ancho Pepper powder conversion, I am so sorry. It clearly needs to be tested again. I do sincerely apologize. Thank you for telling me about this. LOL Don’t feel bad at all. This is great conversation and it turned out excellent considering I thought it would be almost double potent! You don’t have to apologize at all. Hey, this is free stuff here! I wonder how many fluid ounces you have from the soaking the Ancho peppers? Wow you are so nice! And yes, I too think the water from soaking the peppers has to be the other variable. In terms of spiciness it should be the same because I ground down the chiles to determine how much powder you would need. But I failed to account for the water that the peppers would absorb. But you were short by about 12 ounces. That seems like a lot. I should also provide the weight of the onion. Thanks again for being so understanding. It took me 2 months, but I finally perfected the Ancho Chile Powder method! I’ve actually added a lot more information to this post including instructions for baking (great for boneless, skinless chicken breasts) and more ideas on adobo sauce. But I digress. Basically, if you’re using the powder, pour your marinade into a measuring cup and just add water until you get to 2 cups of marinade. That’s what we were missing, the water from soaking the chiles. The consistency of the marinade is quite different (it seems runny when you add water), but it works just as well and tastes just as great. That is what I was thinking in my head, but I wanted to test it out and make sure. 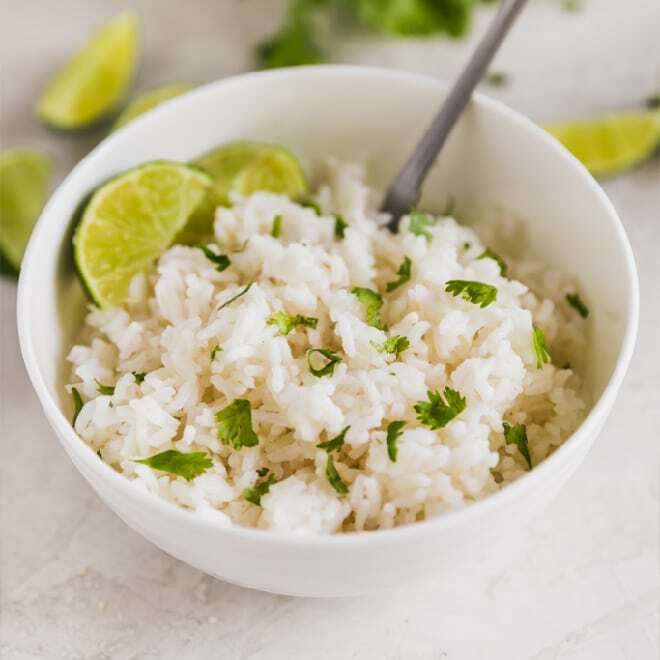 There are some brands of chipotles in adobo that have more sauce in the can (I discuss this in the post above) so if you chose one of those, you wouldn’t have to add quite as much water. But anyway. Thanks again for pointing out this deficiency so I could correct it! These recipes are fantastic!!! We just made this amazing chipotle chicken, cilantro lime rice, slow cooker black beans, peppers and onions, and guacamole. It was so very close to chipotle, almost better!! (Because we have leftovers for tonight!!). Thank you for sharing these recipes with us. We love chipotle and are so thrilled to be able to recreate our favorite foods at home. Thank you so much Rachele! I really appreciate your support and I’m so glad the recipes are a hit in your household. Yes! Excellent! Really delicious! Thank you so much for this! I only had a couple of ancho chilies on hand, so I substituted mulatto chilies to weight. I’m not sure how this compares to anchos only, but the flavour I came out with is great. I’ve also seared my first batch in a cast iron pan with a lodge grill press to very fine effect, but it was super messy so I’ll be grilling the rest outside. Mmm, love that Maillard browning! FYI: I couldn’t wait two days to taste this chicken, so I used a technique I picked up from another recipe to soften those chilies up in a fraction of the time: I stemmed and seeded and then toasted them all in a dry pan, stirring frequently until fragrant but not smoking, about five minutes, and then microwaved them in a quart of water and two additional tablespoons of adobo sauce for about 6 minutes to soften them. I then used about a quarter cup of that water to rinse the sauce from the chipotle chilis into the food processor to maximize flavour. Feel free to give this procedure a try and report back—it shaved 12 hours off the wait! Ryan, thank you so much for your amazing comment! You are adding value here left and right. :) So first, I’ve never had a mulatto chile but I will definitely see if I can find them! If only for “research” purposes and also because I’m curious. And thank you a million times over for your super-soak technique. I am definitely going to be testing that out so I can add it to my post. That is perhaps the last stone unturned for me, beating the soaking time on those chiles. That’s awesome! Thank you so much! I can’t wait to try it out. I will comment again and let you know when that happens! You said “2 T. of salt”, did you mean tablespoons or teaspoons? I did two tablespoons, and the marinade was super salty. However, once I marinated the chicken and grilled it, the chicken tasted fantastic. Hi Jonathan, I did mean 2 Tablespoons. And I would say the same thing as you – the marinade tastes super salty, but the final chicken does not. It sounds like a lot of salt, but when you remember that 2 tablespoons is supposed to season 10 pounds of chicken total, it sounds slightly less crazy… I think. Glad you liked it!! I’m really excited to try this! I just ordered my ancho chiles from amazon! Do you soak them in the fridge? Or do you just leave the bowl on the counter overnight? Hi Jason, I’m so excited FOR you! :) I do not soak them overnight in the fridge, I just leave them on the counter at room temperature. I have never had any issues. Good luck! I’m hosting a picnic this weekend and cooking for 35 adults, I’m planning on cooking 8 pounds of chicken, I have several questions for you, If I add chipotle peppers in adobo sauce with seeds will my chicken be super spicy? we enjoy spicy food, Can I marinate chicken for more than a day? finally I’m planning on cooking boneless chicken breasts for this can I sear in the grill pan and cook in oven? Should I line the pan with parchment paper or oil bottom of the pan and only cover the top of the pan? Thanks so much!!! I have never added the seeds to my marinade, but yes it would definitely make it spicier. I am not sure HOW spicy, though. It’s hard to quantify spiciness. If you have ever cooked with chipotle peppers, you might have a better handle on what you enjoy. You can marinate the chicken for more than a day, yes. I have marinaded it for 2 days myself. As for your cooking method, I haven’t tried it but I am sure it would work just fine. I would oil the bottom of the pan (it might not even be necessary because there is oil in the marinade, so I don’t think the chicken would stick). The parchment paper just goes over the top of the chicken, not on both the top and the bottom. Did I forget anything? I hope not!!! Thank you and good luck! Thank you so much for the detailed info, this helped me so much! I thought I’d pass along that the first time I made this I used the adobo sauce from a can and it turned out fine but for my second run I used a bottled sauce (no need to dirty a strainer or waste peppers – yay!) and I found the flavor to be spot on! The kind I used was the Badia Chipotle Mild Sauce (beware, there’s nothing mild about it – it has quite a kick), I found it right in my grocery store’s ethnic aisle. Amy!!! You rock my world. I have been wondering all this time, is ever possible to buy JUST adobo sauce? For some reason I thought this was not possible. I would much rather buy just bottled adobo sauce… I use it all the time! It goes in the Chipotle Copycat salad recipe I’m posting soon, but just 1 Tablespoon, and today I found myself opening a can of chipotle peppers just to get that 1 tablespoon. I put the rest in the freezer until I make the marinade again, but having a bottle of adobo sauce is obviously the answer. Thank you so much for this tip and for the brand name. I will track this down and try it out and add the info to my post (with credit to you, Amy, of course!)! GENIUS!!! I am having a taco bar at my son’s graduation party and this recipe sounds great! If I make the chicken in advance, do you think it could be re-heated and kept warm for several hours without drying out? Thanks for sharing! I just discovered your blog and can’t wait to check it out. Hi Betsy – YES. I would definitely use dark meat (chicken thighs) and you shouldn’t have any issues. Are you thinking crock pot? People are going to love it! Great idea! I am considering trying this for a group of 25. Can I make the ckn ahead of time and freeze it? If so, what is the correct way to heat it without it getting dry. Looking forward to trying this recipe. Hi Carolyn, I have never made the chicken ahead cooked and then reheated it. I have, however, frozen the chicken while it’s in the marinade and then cooked it after that. It was perfect! I think freezing & reheating it once cooked would probably work fine although like I said I haven’t tested it. If I were doing it, I’d probably reheat it in the oven at 350 degrees or so, maybe for 30 to 40 minutes, covered in foil. This is just off the top of my head. I will try this out and report back (I will also try reheating in a slow cooker) although likely not in time for you to know for your gathering. I do hope you like it. Also, with regard to avoiding dryness, first be sure to start with the dark meat. That’s your best insurance against dry chicken! Then, using the foil on the pan in the oven should help prevent it from drying out too. Thanks for your question and good luck. I will definitely reply again (and update the recipe) once I’ve tried this out. Thank you so much! Hey! I want to use a blend of chicken breasts and thighs, and I was hoping to do it all in the crock pot….what do ya think? Because I’m thinking more of a pulled chicken for tacos. I know it won’t have the same texture. But hoping it would still give it a great flavor? Hey! So I want to use a blend of chicken thighs and breasts for pulled chicken tacos. But I’d like to do it in the crockpot? I know it won’t have the same texture but hoping it will still have the great flavor. Thoughts? Hi there Bee! The marinade is outstanding and I think it would be fantastic in a crock pot and used for tacos. I will add this to my list of things to try out, too. I am currently testing out the freeze-ahead options! I plan to reheat it in a crock pot (although it has already been grilled so it won’t be the same). But I think it would work just fine. Delicious, even! Hey. So if Im using a total of 5lbs of a mixture of chicken thighs and breasts in the crock pot, how long would you cook it for? And would it be best on low or high do you think? Hi Bee! I’m a big fan of: 3-4 hours on HIGH or 7-8 hours on LOW. This seems to be a the standard crock pot time for most things, including chicken. If you are around, you could always check it earlier and see if it’s done sooner. I think the results (taste-wise) would be the same no matter if you did high or low. Thank you so much for your help! It turned out very delicious and just melt in your mouth tender! Perfect ? This looks like an awesome recipe. I will be using chicken breasts. Do you think it would dry out the chicken if I cut it into small pieces then baked it? You are a rock star. This is so informative. Thank you for reminding me that I want to get a grill press. This recipe sounds so good I can’t wait to try it. But you will never convince me to toss those chipotle peppers ;-) Also I had no idea about wheat in canned chipotles! That stuff pops up in the weirdest places. This recipe is awesome!! I made 15 lbs of chicken along with the rice for my daughter’s graduation party and it was a HUGE hit, with all of my friends begging for the recipe and my kids asking me to make it again! So much more economical than ordering Chipotle catering!! I used the quick method for the chilies, grilled the chicken thighs then put it in a big electric roasting pan on low for serving, and it stayed nicely moist., although I was pretty generous with the marinade up front, so had some extra and just mixed it in the pan. So glad I just spotted the guac recipe as well. Thanks for your easy to follow and nicely detailed instructions. I love this!!! If you have time to answer this question, did you just use the one marinade recipe (I have previously identified it for 10 lbs. of chicken) or did you double it? Just wondering if the marinade works for up to 15 lbs. of chicken. :) I honestly could see how that would happen because that stuff is so potent. Such a wonderful story. :) Thank you so much for sharing! Glad it was a success!! Is the 2 tablespoons of salt not too much? I increased the recipie by half, and the salt was the only thing I left at 2 “shy” tablespoons. Really weary about adding a third… Thoughts? Hi Kalli, I personally do not think 2 Tablespoons of salt is too much, and if I were increasing the recipe by 50% I wouldn’t blink an eye adding a third Tablespoon. 3 Tablespoons of salt seems like a fine amount (to me) when you consider that marinade is going to season 15 POUNDS of chicken. I know I had another reader who also though 2 T. of salt seemed like a lot, and that person said the marinade itself tasted too salty, but the finished chicken was perfect. And of course we are all only eating the finished chicken, no one is eating the marinade! That being said, you can ALWAYS add more salt to the finished dish if you find it lacking. If you are weary of the salt, just cut back and add more later if you need it. Good luck, I truly hope you love it! Meggan – Thank you for this fabulous recipe! I made (Method 2) yesterday. Such a wonderful smokey flavor. Both my husband and I loved it. We started thinking we would make taco salads with the chipotle chicken but quickly changed to chipotle chicken nachos. Yum! ANd I froze the remainder of the 5 lbs of chicken thighs. Good suggestion on the thighs. Much tastier than breast. Hi Meggan, I have a question, do I have to soak the ancho powder in water as well, or pour in the blender with the rest of the ingredients? Hi Tim, you do not soak the ancho powder. Just blend it up with everything. You end up adding more water to your marinade to equal 2 cups, but there is no need to soak the powder. I am sorry this wasn’t clear. I’ll try to fix the wording. Thanks so much for taking a look at this post and please let me know if you have any other questions. A little note about me. I’ve been eating Chipotle every meal for months now to lose weight (didn’t trust myself to go into a grocery store). After losing 60 lbs and feeling like cooking on my own again I came across your recipe. All I can say is a big, heartfelt “Thank You!” this recipe ROCKS! I made it this weekend and loved every bite; the only change I made was to eliminate the salt as I’ve never been much of a salt eater by choice. I was so thrilled with it I shared it with all of my Twitter followers and will send it out to my department at work in a “Weekly Wellness” blast I do. Keep up the good work! Sorry, forgot to mention in my previous post the Chipotle peppers (in the adobo sauce) can be blended with tomatoes, onion, cilantro, lemon juice, and other pepper types (anaheim, jalapeno, etc.) to make a killer salsa for chips. Thank you for this recipe. Everybody seems so happy with it. Just a question: Instead of putting the marinade in a freezer can it be kept in a refrigerator? and how long? Hi Gabriel, you can certainly refrigerate the marinade. I am not sure how long though, at least 1 week. I’m not a food scientist though so I don’t know for sure! I know I’ve kept it refrigerated for over a week and didn’t suffer from any flavor loss or apparent spoilage. I’m glad the recipe was a success! Do you think you could cook this with the marinade in a slow cooker? Or would the flavor be over powering? Hi Rachel, I haven’t cooked it in a slow cooker. However, I don’t think the marinade would be overpowering. I have cooked this in a cast iron skillet many times and I think it’s probably pretty much the same – nowhere for the marinade to go, it just stays in the pan (vs. cooking it on a grill where some marinade might fall off). I have reheated this chicken in a slow cooker (it was already cooked) which is not exactly the same as what you are describing, but it was delicious! I definitely need to try making this chicken in a slow cooker. I am always re-testing some aspect of this recipe. :) Good luck! Can’t wait to try this!!! Has anyone tried this using a George Foreman grill? Hi Terry! If anyone has tried, they haven’t commented. But, I think it would work really well. Why not?! It works great on a cast-iron indoor grill pan which is kind of similar, right? Should be glorious. :) Good luck! Thank you so much for sharing this recipe. It was great!! Meggan – Thank you for taking the time to work this out and post it. I ran a test last night and it was FABULOUS! I will now make 10 lbs for my husbands BD party. I used the Chili Powder (easy), chicken thighs, and cast iron skillet. Perfection! Thank you so much, Tyler! I’ve read all the comments and your responses. But, I just want to clarify it before I start making it. Hi Fay, yes. You do drain the chipotle peppers but reserve the adobo sauce (you probably know this but I just want to make sure). Blend with ancho chile pepper powder, onion, spices, and oil. Pour into a measuring cup and add water until you are at 2 cups. Yes. Good job! I know this recipe is kind of overwhelming. This recipe looks great, but I only have a mini food processor and it definitely can’t hold two cups. Would it be possible to make the marinade using a Vitamix blender? We made this for Thanksgiving and it was delicious! We made beans – the bacon (better than Chipotle), salsa, rice, and chicken. My three-year-old would eat Chipotle 9 days per week if you allowed him and he loved it. This is certainly a more cost-effective option. Thank you for taking the time to formulate the recipe and sharing. Hi Meggan! I’m excited to try this recipe–it looks amazing! I know you mentioned freezing the marinade, but have you also tried freezing the chicken after it’s cooked? 5 pounds is a lot for just me and my fiancé so I’m trying to figure out if I should make less or freeze some of it for later. HeyHey Meggan! Can I use Olive Oil instead of Canola oil? (I never use canola and don’t have any, if I buy some I’m unlikely to ever use it again!) Sorry if this is a stupid question, I’m a pretty novice cook! Robyn, YES! Not a stupid question. I use olive oil and canola oil interchangeably for the most part, except perhaps in baking if the olive oil is too fruity. In this instance, you would never notice the taste anyway… and I am going to re-write the recipe to include olive oil!!! I’ve made it that way myself. :D Thanks!!! I just made this for the second time inside as I don’t have a grill (small apartment). I used a cast iron pan and boneless skinless breast. If you marinade it for at least 30mins and cook it to the correct temperature, it is very tender. I did not personally care for the results in the oven (it wasn’t bad, it just wasn’t very chipotle-like to me). I added a tiny bit of liquid smoke, just a few drops, to the marinade. It just gave it the tiniest hint of a grilled taste. Basically, I cooked it and it didn’t even make it to being used in a recipe. I ate it all :( If you like chipotle, this is as good as it gets at home. Honestly, I think I like the home version a bit better. I will try this again when I pick up some thighs from the grocery store. Hi Alice!!! This is a lovely comment despite the sad face. :D You are right, baking chicken breast in the oven is not quite the same as Chipotle’s. But, I’m glad you found a way to make it indoors that you enjoy! Adding the liquid smoke sounds really good, I’m definitely going to try that! Thanks again for sharing your experience. I seriously appreciate it! Take care. M..Meggan what other kind of animals can I use for this recipe. I tried lamb and it was delicious. I was wondering if I could use ghost peppers instead of ancho chilies? Hi Ross! You tried lamb? And it was good? That’s news to me! I’ve been meaning to try it on beef but haven’t yet. Ghost peppers? Aren’t those INSANELY hot? LOL! Sure – use them if you want to! You’re quite the adventurous eater! AH.MA.ZZZZING!!! I did a Chipotle Bar for a b-day party, and even though I was a little skeptical of getting awesomeness from baked chicken breasts, I decided to try it. I followed the recipe closely with the quick soak method and removed all the seeds, and marinaded 10 lbs in 3/4 of the marinade for about 18 hrs. The only difference was I removed the parchment paper at the end and broiled for a few minutes. It TASTED GREAT when I cut it, and I transferred it and some liquid to a slow cooker to keep warm for the party. Several hours later my exhausted husband and I sat down to a late post-toddler-party-madness dinner. I expected cold and dry chewy chicken. What I got instead was mindblowingly tender chunks of perfection. My goodness. How is that possible? I love you. Thank you. CHRISTINE!!!! I love you too. I love that you made my recipe (took a gamble on a stranger’s blog) and had great results, especially with the chicken breast. I think the broiling was genius – it would add that caramelization normally reserved for grilling. Great idea!!! I’m so glad this worked out for you. Makes me want to cry or sing or something. Take care and thank you so much for your comment which has made my day/week/life. Hello Meggan, thank you so much for the post! I’m a pretty novice cook and have no idea what I’m doing, but I’m good at following instructions and as I’m typing this comment I’m preparing your recipe and cooking something legit for the first time EVER! 1. Did you see the ingredients items listed on the Chipotle website for every items they serve on their menu? I’m asking this because you use Ancho Chiles and Adobo Sauce while Chipotle listed only Chipotle Chile on their ingredient list for the chicken. 2. 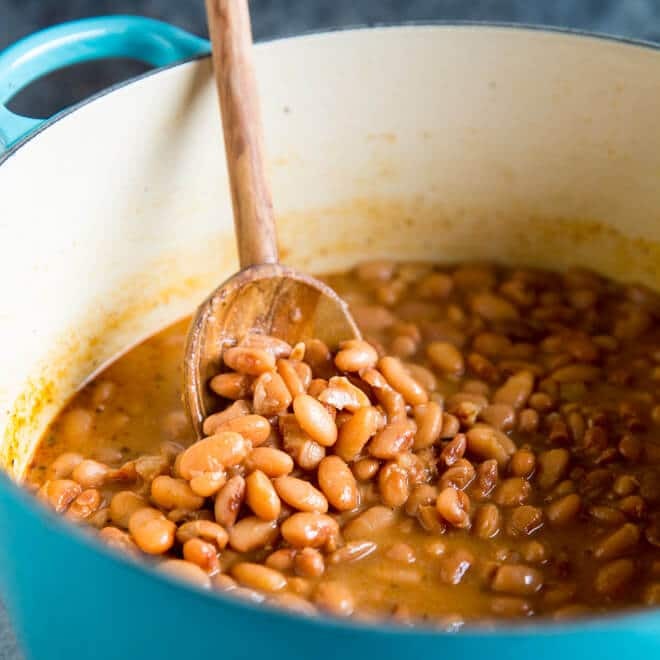 I was looking through the rest of your recipes but never found the Vegan Pinto Beans and Brown Rice recipes :(, is there a future release where you will post those two recipes? Or maybe guide me in the right direction to prepare those two items? I would appreciate any feedback. Thank you again and have a good one. 1. Hmmmm, that is interesting about the ingredients list. I have for sure looked at it, but not recently. Chipotle chiles are typically canned in adobo sauce, so they would get that flavor there. But, maybe they now just use the chipotles (which are dried jalapenos) instead of the anchos (which are dried poblanos). I may have to experiment with my recipe. I do think the flavor really comes through the way I have it now, and hope you agree. But, it would be a lot easier if I could eliminate those dried chiles entirely! I’ll have to work on that. Thank you so much for that insight! 2. I don’t have the vegan Pinto beans but I hope to add them. I don’t know when, but I will try to move it up in my schedule. Thanks so much for you comment and I hope you love what you cook! :) Take care. Hello, Meggan! Thank you for this! Since the restaurant chain has received such negative press lately, we decided it would be better to just do it ourselves. I have augmented your recipe, followed to the precise letter, with the addition of a jar of Herdez’ Chipotle cooking sauce. Perhaps redundant, perhaps overkill, but it works for us. Also, since my wife’s tastes skew spicier than most, I add dried chipotle pepper flakes to the marinade. But hats of to you, Meggan — the basic recipe alone is better than Chipotle’s in the first place. I think the Herdez sauce adds an extra layer to the meat such that I can also marinate and place breasts on the grill without loss of moisture. Also, I use indirect charcoal heat to grill them and then direct heat to achieve the all-important char. No, I’m not a shill for Herdez; I’m a recently retired federal employee with time on my hands and who cooks for my still-employed wife who used to eat Chipotle chicken bowls once a week. Thanks to your recipe, she can now have it whenever she wants, and it’s sure to be a hit at our next dinner party. My gratitude to you is only exceeded by my gratitude. Hi, Darryl! I’m so overwhelmed by your thoughtful, lovely comment. I am definitely going to seek out the Herdez Chipotle cooking sauce. I have to say, I’m trying to train my taste buds to “skew spicier” anyway. I’ve started adding dried chili flakes to everything! Not sure if that will do the trick. :) I do think the breasts run the risk of drying out if grilled, so I can’t wait to try your adaptation. Thank you again for your comment, your tips & tricks, your support, and your gratitude! Also congrats on your retirement. :) Your wife is one lucky lady! …Speaking of charcoal, what do you think of using mesquite? I started to buy some today, but I don’t want to mess with something that’s already working out so well. If it ain’t broke, why fix it? You know, I haven’t dabbled in the whole flavored grilling/smoking situation. My brother has a smoker and knows a lot about that stuff, but I’m just a dreamer at this point. I think if you have the time and the interest, why not give it a shot? You clearly cook for the love of it and there just aren’t enough people like that around! I made the Chipotle chicken for my son’s high school graduation. People thought I had it catered. I followed your recipe exactly and used the quick soak method. Thank you for the recipe. Could this same marinade be used to make a copycat chipotle steak? If so, what kind of steak should I use? Hi Anakin, you could certainly try it on steak. I don’t know if it would be the exact same as Chipotle’s, but I think it would be delicious. They use round steak for the “steak” and chuck for the “barbacoa.” I hope to test this out at some point and post my findings so we’ll all know for sure! Take care. hola patry, por favor me dices de qué marca es el lápiz color crema? Can the same recipe be used for the steak? Ho Bonni, it absolutely can although at this point I cannot claim it is a “copycat.” I haven’t tested it or reviewed their ingredients. It’s on my list to do, though! But in the meantime, you can certainly try it out. It’d probably be super delicious, copycat or not. Thanks! Take care! Anything in particular you’re wondering about? I’ll help if I can! How many Ancho chilies are we suppose to use for the slow soak process ? Hi Armando, it’s a 2-ounce package but because the size of chiles varies, the number would vary. I would say it’s 2 large chiles, or 3-4 small chiles, or a combination such as 1 large and 2 small. But I only find them in the 2-ounce package so that’s what I get. I hope this helps! Hi Megan,! We LOVE Chipotle at our house and couldn’t be happier with the out come of the pork and chicken! Wonderful!! I did goofed on the chicken and used more of the liquid so mine did not come out as a dry rub but rather a thick marinade but the results were still fantastic. Thanks for sharing!! Surprised there is no citrus in your marinade, such as lime juice. But, I guess cause there is vinegar in the canned chipotles. Love the details you provided for your recipe. Now that you mention it, that IS a little strange (no citrus). Ha. Yes, I am so grateful for all the questions and insights readers have shared over the years so I could build this recipe up with all those details. It didn’t start out that way! Thanks so much for your kind words. :) Have a great week Jack! How many burritos do think 5 lbs of chicken makes? Would it affect the taste if I stored extra cooked chicken in the freezer? Hi Bryson, I’ve made the chicken and stored it in the freezer and reheated it later in a crockpot, and it still tasted great. So you should be fine there. As far as how many burritos would 5 pounds of chicken make, I don’t know off-hand but I would guess at least 10 (of the 10-inch size). I mean, that would be roughly a half-pound of chicken per burrito if my math is correct… I suppose it depends on what else you are putting in there, you could obviously use less chicken and get more burritos. I hope this helps! I’m not sure how to get a whole onion in there and only kick out 2 cups of marinade. Seems physically impossible….maybe I’m bad at picking out onions. I want to try this and some other Mexican recipes you offer, but the audible commercials are truly annoying, especially at 6:30 in the morning when I’m trying to not wake my husband. As a webmaster, I can tell you that anything audible that plays automatically is the number one reason people do not re-visit a website. Those who like to surf while on break at work (and those who are doing it on company time!) are not going to come back at all. Affiliate marketing for money is a great little income producer, but you’ll have a lot more visitors if you can the commercials. Just trying to be honestly helpful. Your recipes look fabulous and I would love to try many of them. Hey there! I agree with you 100%, I click off a site IMMEDIATELY if something auto-plays. I will notify my ad company immediately because that is not supposed to happen. I’m really sorry about that. I would never visit a site again and I certainly wouldn’t be nice enough to tell them. So, thanks for that. I cannot get rid of ads on my site (they fund the operation) but they should not be playing sound automatically. Sorry again. Take care. They still play, and I almost left the site. Luckily I am at home and in the middle of the day. May not come back though. I tried this, and sadly, did not have any success. It was not at all similar to Chipotle, and I didn’t like it. I see some god reviews, so I’m wondering what I could have done wrong. Did I get bad Ancho chilies or something? After soaking them (long method), they were leathery like fruit roll-ups. Is that normal? Just wondering if anybody had similar issues and had to make adjustments. Hi, Meggan. I’m pretty sure I added everything. I used one of those little “bullet” blender thingies. (Cheap $10 walmart thing.) The result was indeed a coarse paste, but the color was more of a sick looking orange, not the rich color like your photo. I used dark meat (white is always too dry), and I baked it. I may try a skillet next time. Grilling would be ideal, I think, but since I’ve downsized from a 4-bedroom house to an apartment, I can’t grill. Maybe I’ll try again and halve the recipe to make sure I get the right amounts. Mistakes are always a possibility. If you and others had success with this recipe, then I must be doing something wrong. It definitely had an odd taste. Maybe I should use fresh garlic instead of stale, minced.stuff in a jar. I love garlic, just seriously hate peeling it.) I felt that the marinade needed to be a lot sharper. …And of course, baking makes a mushy texture. Thank you so much for writing back. Take care, and have a wonderful holiday season! Hi Kris, a “sick looking orange” color is possibly the saddest thing I’ve heard all day. I’m wondering if it was just a horrible brand of chipotles in adobo, although I didn’t think there was such a thing. Maybe try using a different brand? I would definitely try to use fresh garlic if you can manage. The stuff in a jar is heat-treated so it always has an off taste. However, I cannot imagine that would even show up much considering all the other stuff in the marinade. I completely understand about hating to peel it. I have a garlic press in my shop that works without peeling garlic (you just put the cloves with the skin on right through it, works like a charm) but I’m certainly not suggesting you buy some gadget just for this one recipe! Here is a video of Martha Stewart showing how she peels garlic by putting two bowls together and shaking it. For some reason I haven’t tried this yet, but Martha can’t be wrong! https://www.youtube.com/watch?v=0abnwTGeAiM Anyway, if you get a chance to try again, please keep me posted. You can also email me anytime at meggan@culinaryhill.com. Good luck Kris!! I am not having luck yet finding dried ancho chiles and I got to wondering…if the recipe calls for reconstituting, would it work to just buy fresh poblanos? Or is there something about the process of reconstituting the dried chiles that makes a difference? Hi Rachel, I think the flavor would be quite different if you used fresh poblanos. Not that you couldn’t, but I’m not sure what it would taste like. When the poblanos are dehydrated into anchos, it both changes and concentrates the flavor. They aren’t even really recognizable as poblanos to my taste. Have you been able to locate dried ancho chile powder by any chance? That might be your best bet, if you can’t find the dried chiles. Good luck and thank you for your question! Hello and thanks for posting this recipe. I have made it twice already! First time it turned out great and the second time it dried up. I also felt like the 2nd time maybe I have over marinated the chicken, i think i left it overnight. What is the ideal time for marinating this chicken? Hi Julie, marinating the chicken overnight will not dry it out. I used to actually recommend that, but then I realized that it didn’t make much difference whether you marinate it for 30 minutes or 30 hours. The marinade is obviously very flavorful but it can only impact the chicken so much. Did you change anything else in the recipe? Did you use a different type of chicken (white vs. dark meat) or cook it a different way? Was the chicken marinating in a completely sealed container (i.e., a ziplock plastic bag) or was it just in a bowl that might have been exposed to the air of the fridge? Just checking in case something clicks. :) Sorry you had difficulties. I really don’t think it was from the added marinating time (and to answer your question, I really don’t know what is “ideal” but I’ve frozen the uncooked chicken in the marinade for 2 months and then cooked in a slow cooker and it was still good…). Hello Meggan! Thank you for your thorough explanation. Good to know that there isn’t much difference in the marinating time. Now that I am thinking again, I think I used chicken breast the second time I made this chicken. I will be making again this dish on Saturday and this time I will use the brown meat. Thank you! Hi – Can you cook this in a slow cooker? Yes, you can. I have. You won’t get the crispy, caramelized bits that you would from a cast iron skillet or grill, but it will still be good. I will add instructions for this! 4 hours on HIGH or 8 hours on LOW. Thanks Meredith! Does anybody know of a recipe for just chipotle’s steak? I plan to figure it out at some point soon. I do have the Barbacoa figured out, if you need it let me know (I realize it’s not the same as the steak). I haven’t posted it yet but I have it. Hi Emily! Your question is reaalllllly old so I’m sorry for replying to it now, but I did post the Chipotle Steak recipe on my blog a couple of months ago. The marinade is EXACTLY the same as the chicken one. Exactly the same. Here’s the post if you want to see! Thanks. I’m always looking for a way to make chicken taste better I made the marinade It taste great. and have the chicken sitting in it can’t wait till tonight when I cook it. But I want to know the calories in this marinade? Anybody have a idea? I am going to make this for my son’s grad party and want to cook ahead. I assume that I can cook a bunch of it and freeze it ahead of time and then warm it back up in a crock pot, stove top, or oven? Any thoughts about this? Hi Kathy! I’m always taking questions. :) I have literally done exactly what you described – made a batch ahead, froze it, and then reheated it in a crock pot. Well I assume you could heat it any way you wanted, but I tried in the crock pot and it was delicious. I did it specifically as a test for the recipe/this post and I didn’t realize I never added the information. Thanks so much for your question and please let me know if you need anything else! So excited that you are going to make the chicken for your son’s graduation. So smart! :) And congrats to him! Is the 20 servings off of 5 lbs of chicken (half the marinade) or 10 lbs of chicken (all the marinade). I assume the latter, but on the recipe at the end it lists 5 lbs. Making a lot so I want to be sure I have the right amount of everything. Thanks!! Hi Kathy! The 20 servings is based on 5 pounds of chicken. The prevailing wisdom on this is that 1 pound of chicken will serve 4 people (4 ounces of chicken per person). So 5 pounds x 4 people = 20 servings. At parties, though, people may pig out so you may want to assume 20 servings for 10 pounds of chicken, ha ha! Thanks for asking and I’ll update the recipe to clarify this information. Take care! Meggan, I am so excited to try this for my daughter’s grad party. Chipotle charges $12-14 a person. Yikes! Can this chicken be made ahead of time and reheated? Thanks so much for this delish recipe!! It was a hit at the grad party! I froze a few weeks in advance. My only advice, JUlie, is be sure to give yourself plenty of thaw time so you aren’t rushing to thaw like I was. We kept batches warm in the oven in metal brownie / baking pans. Put some into smaller electric serving / chafing dishes on the table. Made rice in crockpots and also served in electric chafing dishes. So yummy and def cheaper than ordering! CHIPOTLE CHICKEN RECIPE This is amzing, chipotle chicken recipe, I think I can eat this all day it looks so delicious mmmmmmm…… :) thanks for this chicken delight. I’ve made this several times and am certain there was red onion in the recipe (but there is no mention of it in the ingredients or directions anymore). Did I imagine this? Hi Rick! You did not imagine it. I literally removed it last week because I was looking at Chipotle’s ingredient list (to check my own recipe for accuracy) and they don’t have it listed anymore. Or maybe they never did, but that was my source in the past and it’s not there now. I do wonder if the marinade would be better off having it in. I am really sorry for the confusion and I feel bad. I should definitely add this to the recipe notes for any repeat visitors who might be wondering – where did the red onion go?! Sorry again, really. I feel bad. Thanks for the question and take care. I cooked my meat Thursday and we have enjoyed a bowl with the fixing for three days. A great recipe helps to complete our dish. I had the same question as Rick, I shared the link to the recipe with a friend this week and she was confused about how the recipe makes almost 2 cups of marinade. We finally figured out that her recipe was not the same as the one I had been using. I will continue to make the one with the red onion added, but you might want to update the instructions to change the amount that the recipe will yield, just a suggestion. I love all of the Chipotle copycat recipes, thanks for posting them! You know what, I’m going to add the red onion back in. I tried it without, and I just really prefer it with the red onion (not to mention the yield problems). I’m SO SORRY for all the confusion. It comes down to a philosophical question – should I add the red onion because it tastes better, or should I leave it out so it is a “truer” copycat? I’m adding it back in, and I’ll add a note that Chipotle doesn’t use red onion but it tastes better with it. My best judgment says it should be there. Thank you for the comment and sorry again for taking it out for a few weeks! Meggan – THANK YOU SO MUCH for posting this recipe!!! Honestly, this could be one of the best-tasting recipes that I’ve ever made!!! You nailed it!! Using chicken thighs was, for me, the secret ingredient, along with the marinade. I’ve been making bowls for years, but I’ve never been able to get grilled chicken breasts to taste like this! OUTSTANDING!!! I’ll be trying your other recipes – Thanks for sharing!!! Hi Bob, I’m so excited by your excitement! I know though, chicken thighs make everything better. And yes, the marinade is awesome, the recipe is solid, it’s one of my go-to’s. Thank you for sharing your thoughts and your success. It makes my day so much better! Have a terrific weekend and take care! Thanks so much for this recipe. Is it possible to soak the chiles for too long? I will soak them the night before but won’t be able to take them out til the next night and just want to make sure they aren’t gonna end up too “pruney”. Thanks! Hi Rebecca! Thank you so much for the question and I’m glad you liked the recipe. :) In my experience, the spiciness mostly comes from the adobo sauce, not the ancho chile powder. If you didn’t add the water, then the overall marinade would be more concentrated up to a point but there are a lot of variables there too. So what I would do, personally, is leave out a can of adobo sauce (use just 2 instead of 3, assuming you are tripling the recipe ) and definitely don’t add any chipotle peppers or their seeds. You can also use less chile powder just to be sure. If you have any other questions, just let me know! Thank you! :D And good luck with your amazing Chipotle feast! Meggan – I posted back in September but the event was canceled that weekend. I finally got to serve your recipes this past weekend. Everyone liked it – many compliments!! One even said they thought it was BETTER than Chipotle! :-) I passed on the name of your website so they could make it as well. i don’t typically follow food blogs and just stumbled upon this recipe randomly but I have now made it more than any other recipe EVER. It is absolutely fantastic and we make it at least weekly. It’s SO flavorful and the chicken thighs are so tender. Such a perfect way to eat healthy. This is the only recipe I follow exactly AS-IS. If you want it spicier, you can add some seeds but that is the only variable I’d think of tweaking now and then. This is actually better than Chipotle and one of my most invaluable recipes. Thanks! This is the nicest comment I have ever received! THANK YOU! You have made my day, maybe my life. I make this all the time too, and like you said, it’s one of the tastiest ways to eat healthy. Thank you so much for letting me know, and I’m glad you like it! Take care. I was wondering if I can cook this in a pressure cooker? Sorry if this has been asked already. Sounds really good. Hi Michelle! I’m sure you can. I have zero experience with pressure cookers, but if you know how to cook chicken thighs in one in general, this recipe should work just fine! Thanks for the question. Yummmm!! This looks like such a simple marinade and I love chipotle peppers and adobo sauce. I look forward to trying this! I love this recipe, but did you remove information on the quantity of dried chile ancho? I feel like there’s a lot less information than last time i did this recipe. Is it only 1oz since it’s only for 1 cup of marinade now? Hi Sébastien, I’m sorry for the confusion. I got a lot of feedback from readers that my post was too complicated and overwhelming, so yes, I moved a lot of the information to the recipe card. I also cut the recipe in half because people don’t want to make so much marinade. It’s 1 ounce of dried anchos instead of 2, yes, and it makes just 1 cup of marinade for 5 pounds of chicken. I will review this and make sure it’s clear! Hi Meggan, where it says to use dried ancho chiles, in the first step to adding the marinade, it says to remove the stem and seeds with gloves. However, in the third step, it says to do the same thing by rinsing it out. What do I have to do? Hi Ashwin, I am so sorry for the confusion. I completely reworked this recipe and obviously messed up the recipe notes as you have seen. I removed the part in Step 3 because that is leftover from the slow-soak method for ancho chiles which I’m no longer listing on the blog. So, step one is right (removing the seeds and stem while the chiles are still dry, before you power-soak them). I’m so sorry again for the confusion and I corrected it, thank you so much! Thanks! I wasn’t completely sure what to do. I have been using this recipe for a while, absolutely love it. Did you change something? The site design/layout has changed, but I feel like the recipe itself changed recently as well. Did you cut the recipe in half? I swear I used an entire onion before, and a 1/4 cup of oil. Please let me know. Thanks! Hi James, I am SO SORRY for your confusion. Yes to everything. Based on tons of reader feedback, I cut the recipe in half and also just recommend the ancho chile powder now instead of dealing with the dried chiles (although all the information for the dried chiles remains in the recipe). People just felt like the post was too long and overwhelming and no one knew what to do. Too many options! So technically all the options are still there, in the recipe itself, but all that extra text is not in the post anymore. And the recipe is smaller. I will add a note to the recipe about this so no one else is confused (one other person who makes the recipe regularly contacted me asking what happened, too!!! I feel so bad! And I’m also flattered!). So. That’s that! 1/4 cup of oil and a whole onion, yes. Just double everything in the recipe if you want to make it the way you made it before, enough for 10 pounds of chicken. Thank you and sorry again, and please let me know if you have any other questions! Thanks Yolanda! It definitely helps the chicken to stay juicy! This chicken is OUT OF THIS WORLD AMAZING!!!!!!! I actually used chicken breasts and baked for 30 minutes at 450. Heavenly!!!! Thank you!!! Thank you so much Tashina!!!! You made my day! Glad you liked it and I hope you make it again! I tried this recipe and it’s great. I have a question though. Why no vinegar. On Chipotles site vinegar is one of the ingredients for the chipotle chicken. That’s fascinating! They changed their recipe. I swear I’m not making this up – I live and die by their ingredient list. It’s how I formulate all of the Chipotle copycat recipes on my site. So they must have added it at some point within the last 6 months. They also used to have red onion in their recipe but don’t anymore. I appreciate you pointing this out! I can definitely try adding it. I’m guessing it’s a really small amount since it’s the last ingredient in the list, but still. I’m curious to know how it affects the marinade. Thanks Nick! Sorry for the confusion. The ancho chile powder is basically simulating the flavor of the dried Chipotle chiles you see pictured in their ingredient list. It’s the same thing – they are showing it without the adobo sauce. However, I have friends that work there and the marinade shows up in a bag and they can’t even say for sure what’s in it. I have tried making the chicken with just chipotles in adobo, without the ancho chile powder, and I don’t think it tastes quite right. However, I should probably try making it with the adobo and see how it tastes. No problem. Thanks for sharing the recipe. I’m going to try your others! Thank you for this recipe. It looks absolutely delicious. How does a 4 oz serving have 20 g of fat? Total fat, approximately, is 120 g. Divide that by 20, and a 4 oz serving should have about 7 g of fat. I am trying to monitor my macronutrients, and I want to make sure I am not missing something. Thank you again. Hi Rebecca, I’m so sorry for all of the confusion here! First, I use a 3rd-party nutrition label generator which access a nutrition info API, the same as sites like MyFitnessPal use. So that’s one thing. The 2nd thing is, the nutrition label was generating completely inaccurate so I’m REALLY glad you pointed this out to me. For one thing, it was using 5 pounds of chicken WITH SKIN, but the chicken should be boneless skinless. Also, the recipe is not for 20 servings. It used to be (I used to have the recipe make 10 pounds of chicken) but I scaled it down to 4 pounds of chicken, so now it serves 8. So an entirely new label is on the site. If you feel like taking a look, I hope you are much more satisfied with what you find! The last one was a total disaster. So sorry about that. Oh, thank makes sense. Thank you, Meggan! You are awesome! Quick question. 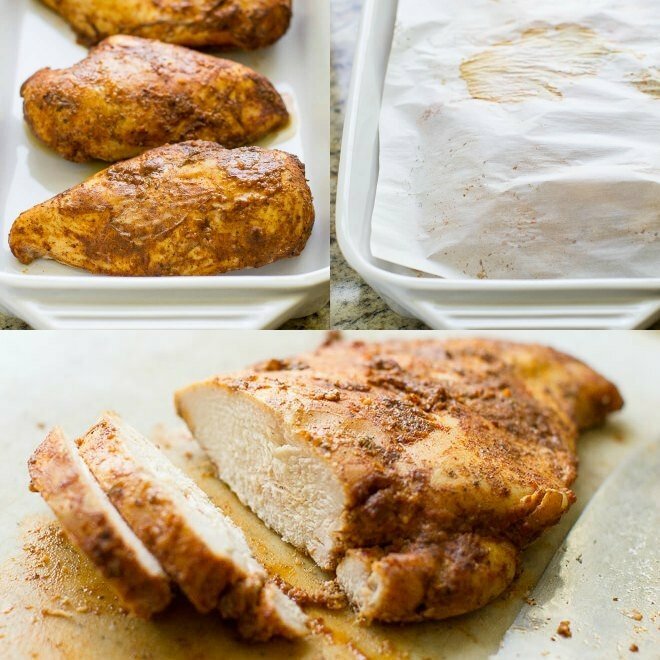 I am making this recipe for a large amount of people (50) and was wondering if it will make a different if I were to marinate and bake the chicken breast as cut up pieces or will that just ruin it all. Hi Rabiya! You make me laugh! You can definitely bake it, you’ll be fine. Cover the chicken with a piece of parchment paper while you back it so the moisture is trapped and the chicken stays juicy. You’ll be just fine! It’s going to taste amazing! Please note 4 pounds of chicken will serve 8 people. My recipe was wrong, it said 4 pounds of chicken served 20 people (obviously that’s crazy). I just fixed it. Sorry for the confusion. Please let me know if you need anything else! Tried this today, marinated the chicken for 4 hrs and it didn’t have any flavor and the chicken was dry. What am I doing wrong? Will the thickness of the chicken breast matter? Does adding water as mentioned in the steps dilute the flavor of the marinade? Was really hoping to like this recipe. Hi Gretchen, how much water did you add? And did you cover the chicken with parchment paper as directed? The thickness of the chicken breast could matter if you did not adjust your baking time based on it. So for example if you were cooking chicken breast cutlets, they would cook much quicker and potentially get tough and rubbery. However, the parchment should help prevent them from drying out. I added about 1/2 cup cos the marinade only made half a cup. Is that too much water? I cooked the chicken in the skillet, but the meat was really thick. I’m going to try to cut the chicken meat into thinner pieces. Not giving up on this marinade yet. Can I just use a Chipotle pepper or two from the can with adobo sauce instead of dealing with finding ancho in my small town? Do you have any recipes that use those leftover chipolte peppers that were in the adobe sauce. I hate to toss them but don’t want a bunch of lost peppers in my freezer. This recipe is best!! I love Chipotle and this recipe right here taste just like their chicken. This makes me soo happy! I made the chicken along with the guacamole and cilantro lime rice. Followed the recipe and marinated the chicken over night. Then the next day, my husband threw it on the grill. It was absolutely delicious, juicy and filled with flavor! Can’t wait to make this again. Thank you for sharing this recipe along with the rest. You’re amazing!! 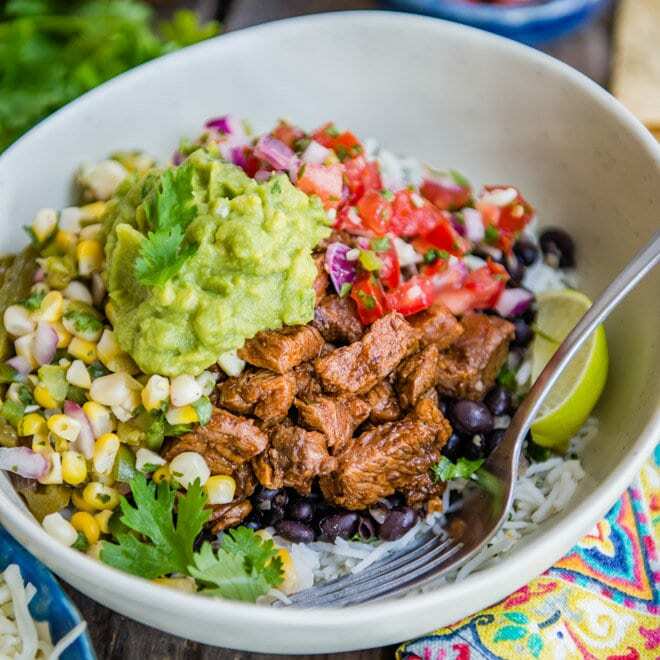 I’m having a Chipotle Bar Party tomorrow, and I wanted to see- could this recipe be made in a crock pot and be adapted to make chipotle flavored shredded chicken? Could I just throw everything in the crock pot with some broth and shred it or would you have any other suggestions on modifying it? Hi Rabia, I’m so sorry I didn’t reply to you in time. The answer is, you can definitely make it in a crockpot and shred it. Did you try it, or did you plan something else because I never replied? So sorry about that. I’ve made it in a crockpot before and it works really well. I hope your party was a success! Thanks! Hi, I’m sorry… I’m a little confused after reading the comments and your blog/watching the video. I am trying to make this this weekend for about 35-40ish people. I don’t have a chance to test out the recipe. In your comments, you say that the ingredient list you wrote up is good for about 10lbs of chicken. Is that still true? Or is what is currently written on the ‘Ingredients’ good for ~5lbs of chicken? Also, in your video it doesn’t show you adding any water into a measuring cup, but we should not skip that step of adding water to the marinade, right? Just wanted to make sure. Also, do you think it would be ok to precut all the chicken, then marinate, and then cook it? Or is it better to marinate the chicken thigh whole, cook the entire thigh and then cut up? Thanks for any advice you may have! I am so confused. I found your recipe awhile back and made it once and we all liked it. It didn’t have a lot of flavor but with all the other items tasted good so I knew I wanted to keep it in family dinner rotation. Last night I was going to make the marinade so I came back to your site and read through all of the comments. In one post you said to someone that it should make 2 cups. The time I made it and followed the instructions to a T it was less than one cup. I read where you said to the man, with the can of peppers, the oil, and a few other ingredients it was unbelievable to only produce one cup. I read the recipe and it says to just use two tablespoons of the sauce without the peppers but I wanted to follow your comment so I used the whole can. I am so confused because the recipe says 2 tablespoons of oil yet the comment said 1/4 cup of oil. Can you please help me with the ingredient list? Also is this chicken going to be extremely spicy because I used the entire can? Hi Sherae! I’m so sorry for all the confusion. The recipe has evolved over time, so you probably made it back when it was made with dried ancho chiles, and now it’s just being made with ancho chile powder. But if you read the comments, many will reference that old recipe. To further complicate things, the original recipe was for 10 pounds of chicken, but the new version is for 5 pounds. Why would I change the recipe? Basically I had too many options in the post, people were getting confused, and overwhelming people wanted the simplest way to make it. So that’s what the recipe is now. But if you made it the old way, you will wonder what on earth is going on. And to your question of is the chicken going to be extremely spicy with a whole can of adobo… YES. But I’m a few days late replying to your comment, so you probably figured that out by now. I’m so sorry for the confusion. *This recipe yields 2 cups of marinade, enough for 10 pounds of chicken. 5 pounds of chicken = 20 servings, 4 ounces chicken per person. Split open each softened ancho chile and rinse the inside to remove the stem and all seeds (wearing gloves is recommended). Place in the bowl of a food processor or blender. Strain adobo sauce into a small bowl, pressing down on the peppers to extract as much liquid as possible (you should have at least ¼ cup). For an especially spicy dish, add chipotle pepper seeds to taste. Add strained liquid to the food processor. Discard chipotle peppers or reserve for another use. Add red onion, garlic, cumin, oregano, 2 tablespoons salt, and 2 teaspoons pepper to the food processor. Pulse several times until a coarse paste develops. With the motor running, pour ¼ cup oil through the feeding tube and continue to process until smooth. You should have two cups of marinade. Reserve one cup for immediate use and freeze the remaining for future use. Meanwhile, place half the chicken in a large freezer-safe plastic bag. Spoon in half the marinade, close the bag, and mash around to distribute. Add remaining chicken, remaining ½ cup marinade, and repeat the mashing until all chicken is evenly coated. Place the plastic bag in a dish and refrigerate at least 30 minutes or overnight. Preheat over medium-high heat. Coat with 2 tablespoons oil. Grill the chicken in batches, turning occasionally until the internal temperature reaches 165°F on a thermometer and bits of caramelized fond have begun to cling to the outside of the chicken, 10 to 15 minutes. Add 1 – 2 tablespoons oil to your grilling surface between batches. 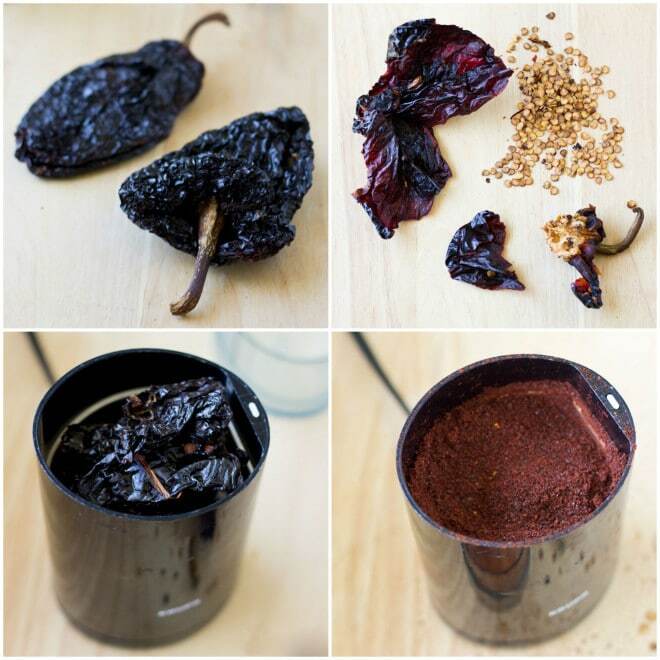 ¼ cup Ancho Chili Pepper powder may be substituted for the dried Ancho chiles. Skip step 1 and add the powder with the other spices in Step 3. After processing the marinade in a food processor, pour into a measuring cup. Add water to reach a total of 2 cups of marinade. Chipotle doesn’t have red onion in their marinade. In the past they may have, but right now they don’t. However, I’ve tried it with and without the red onion, and it’s better with the red onion. If you decide to omit the red onion, you won’t have 2 cups of marinade, but you can always add more water or oil to get to 2 cups if you want to. Use regular (sometimes called Italian) oregano. Mexican oregano is completely different and tastes like marjoram. So with the Chile’s in adobo sauce you strain out the Chile’s and just use the sauce right?? What do you do with the chilies you strain the sauce off? I used ancho chili power option. Hi, do you use ground oregano or whole oregano? Thanks! I’m confused you list 2tbs of the chili powder but all the comments say 1/4 cup also you list add water to reach 1 cup but in the comments you say 2 cups what is the right way? Made this for dinner tonight and it was so good!!! i simplified for 5 pounds and only if you’re using the ancho chilli powder.
. “““““““““““““““““` Make sure it is a cup, if not add water. Then blend it or processor, really well! Put all in bag or bowl to marinate for 30min or more. Then cook with adding to 2 tablespoons to put in pan to cook with. Then add chicken. Cook and let it caramelize on each side, don’t flip immediately so it can happen. This recipe is amazing! I baked boneless, skinless, organic thighs for 45 mins (they seemed a little thick) and they came out amazing! I tried for the first time today your Chipotle chicken, fajita veggies and guacamole recipe and it was a super hit with my family, esp my 8 year old picky eater!!! The recipe was everything I hoped it would be and more. My search for Chipotle chicken bowl has come to an end with your recipes !!! I used the exact ingredients the recipe called for and it made all the difference!! Thank you so much , it’s such a relief that the whole family approves of it. phew !!! Has anyone tried cooking the chicken in a slow cooker with the marianade? Wondering how it’d turn out before experimenting.